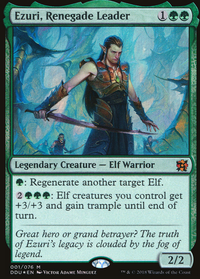 Want to play the most competitive and powerful Elf Tribal EDH deck? This could be your next prized possession. This deck is great fun and I love that elf spamming goodness, but all the while I miss my Deathright Shaman, my Prowess of the Fair , Shaman of the Pack and those super mean black X kill spells, let alone all the great tutors. 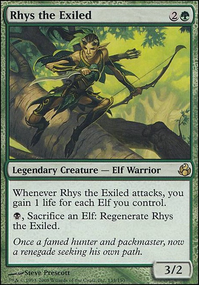 Then I had an epiphany, your typical Golgari commander is either Nath Stax or some cool graveyard build but, Rhys the Exiled is G/B and cares only about elves. This is where the deck took its best change ever. This deck is a secret Ezuri elf deck that splashes black for some fun spells and cool elves, these include and are not limited to the previously mentioned MVPS like Shaman of the Pack, Exsanguinate, some mono black elf tribal remaoval spells, the Tutors and those typical Golgari removal staples. It also received the addition of the infinite combo producer, Umbral Mantel. The deck has a main theme and strategy of going straight up elfball and just going wide with an Ezuri pump or ten. But this deck has so much more with a Life Gain sub theme with Rhys' "elflink" life gain in addition to Essence Warden , Nissa Revane and Wellwisher . 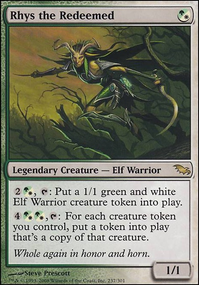 Not only that, there is a great deal of elf token production that helps huge for our Cradles and Shaman of of the Pack drops. The deck can tutor for Hoof Daddy and smash or bring all the wiped elves back from the yard for round two. 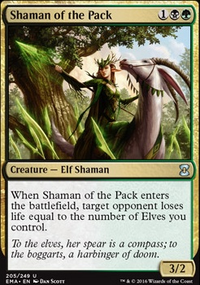 The main win cons are Ezuri, Craterhoof Behemoth , Shaman of the Pack, Exsanguinate , Umbral Mantel infinite, etc. and they are fairly reliable and extremely consistent! Low land count but mana dorks come in clutch. The Lords and surprisingly, many green card draw spells also keep the engine alive. I would love to add a Throne of the God-Pharaoh and Paradox Engine but we'll save those babies for a later upgrade. A solid opening hand is two or three lands, a dork or two, a lord or tutor, and a utility elf. This deck is so good and if you don't think so, try sitting across from it. Enjoy. Really excited to announce that I have updated this baby. I have removed Nissa's Chosen , Masked Admirers , Harmonize , Bow of Nylea , one Forest , Beastmaster Ascension and Obelisk of Urd . The new kids on the block are Mirri's Guile , Aluren , Throne of the God-Pharaoh , Paradox Engine , a Bayou , Herald's Horn , and Phyrexian Arena . I really appreciate all the comments and suggestions! They have really shaped this deck into quite the beast!